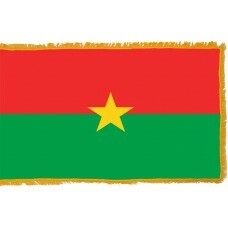 The Burkina Faso flag consists of 2 horizontal bands of red and green. In the middle there is a yellow, 5-pointed star. The red is symbolic for the battle that was fought and the struggle for independence. The green color signifies the vast amount of agriculture within the country and also represents hope and the yellow star is symbolic of the guiding light of the revolution. The flag is derived from the Ethiopian flag and the colors are popular pan-African colors. The flag, as a whole and the colors are thought to not only represent the break of the country with its colonial history but also the unity with the other African ex-colonies. Thousands of years ago, after being first occupied by hunter-gatherers, Burkina Faso was part of the Mossi Empire for over 500 years. Towards the end of the 1800s, Britain, France and Germany were both trying to gain control of the land with France eventually winning and in 1897, Burkina Faso became a French protectorate until 1919. During this period, the French flag was the official flag for Burkina Faso. In 1919, certain regions were divided into a separate colony and Burkina Faso was settled as a self-governing colony with France and was officially known at that time as Upper Volta. On December 9th, 1959, the Upper Volta flag was adopted and had 3 horizontal bands with the colors black, white, and red to represent the Black Volta, White Volta and Red Volta seas, which are the three channels of the Volta Rivers. In 1960, Upper Volta gained full independence from France. The first president of Upper Volta was Maurice Yameogo, who banned other political parties. Over the years, the people of Upper Volta were unhappy with the government as it was taken over, again, in 1966 by a military coup. In 1983, a new ruler named Thomas Sankara became president and in 1984, he decided to change the name of the country to Burkina Faso, which translates to "Land of Incorruptible Men." 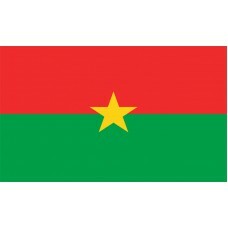 At the same time as changing the name of the country, they felt that a new flag should be utilized which is when the Burkina Faso flag used today was officially adopted, on August 4th, 1984. Burkina Faso is a landlocked country in West Africa that shares borders with Mali, Benin, Togo, Ghana and Ivory Coast. Its largest city and capital City (also the oldest city that exists on Earth) is called Ouagadougou. Burkina Faso is quite renowned for the strange and original names of its cities, which include Leafy Bobo-Dioulasso, Gorom-Gorom, Bouroum-Bouroum, Tin-Akof and Rambo. Burkina is one of the poorest countries in the world at the moment. The economy is mainly based on agriculture and livestock and despite having many famous and beautiful landmarks, tourism is very limited. The capital city has many landmarks, including the Cathedral of Ouagadougou and Burkina Faso is also home to the "Mare aux Hippopotamuses" (the Lake of hippopotamuses) which has around 100 hippos, it is also home to the Karfiguela Falls, Lake Tengrela and the Arli National Park which protects the elephant population in Africa. And one single night has launched its triumphal march. Towards the horizon of good fortune. In the acquisition of liberty and progress. Motherland or death, we shall conquer. Here and there were polluting the sacred soul of independence and sovereignty. To the glory of the work of liberation and emancipation. Down with exploitation of man by man! By all men of today and tomorrow, by every man here and always! Popular revolution our nourishing sap. Undying motherhood of progress in the face of man. Where at last national identity has the right of freedom. Everywhere the harvests of patriotic vows ripen and suns of boundless joy shine.